by Daniel Skach-Mills To step out, once and for all, from under the sagging, word-weary roof of the mouth. To be the vast, unfeathered nest of emptiness out of which sound arises, and into which it lands. To live like the open ear of a furrow listening for a seed— loves infant hand knocking from inside, wanting in to be the world. 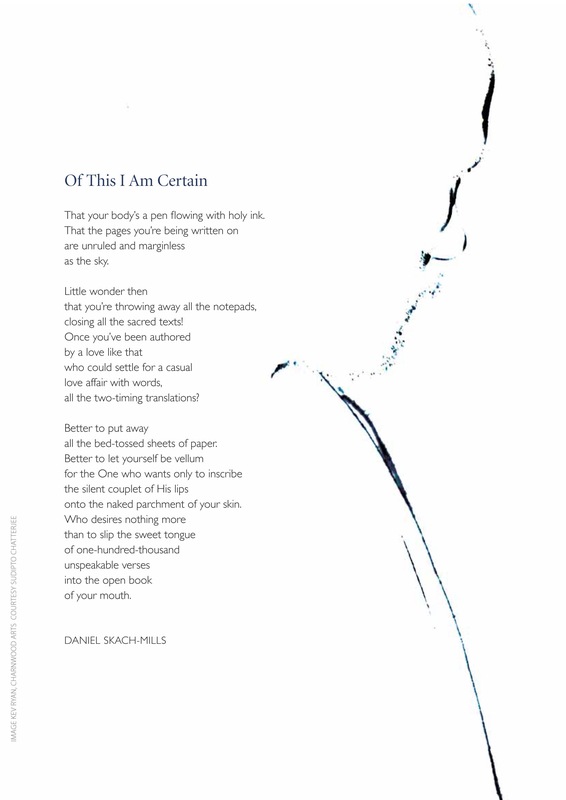 DANIEL SKACH-MILLS is an award-winning poet whose poems have appeared in a variety of publications and anthologies including The Christian Science Monitor, Sojourners, and Open Spaces. His books include: The Hut Beneath the Pine: Tea Poems, In This Forest of Monks and The Tao of Now.